Great for the heat, golf, boating, fishing, motorcycling, beach, outdoor events, sports, hot flashes, night sweats, migraines and anything where your body temperature may soar. Coolz Down crystals are air cooled by taking advantage of the evaporation process. It will feel like you have your own personal air conditioner. Wear it around your neck like a tie or wrap it around your head as a head band. Neck ties/bandanas filled with special crystals that when soaked in water will stay cool for days. 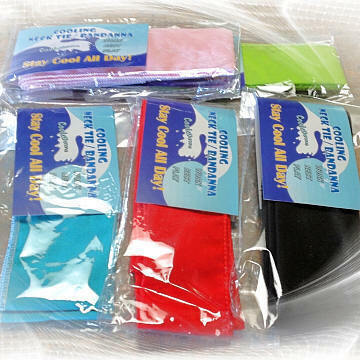 Wear them around your head or neck and feel cooler for outdoor activities such as gardening, sports, or just walking the dog. Simply soak in water for 5 minutes. Then place around forehead or neck and be prepared for instant relief. Use it over and over again by simply reactivating it in normal tap water.